This beautiful ring was made with the customers own beautiful 5.74cts blue sapphire and old cut diamonds totalling 0.30cts.The design was made to suit somebody who favors dramatic styles and is inspired by swirling waters in a whirlpool. 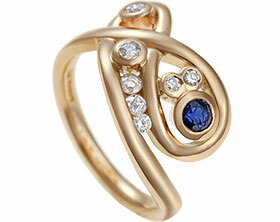 Carol's tension style diamond and sapphire dress ring. Bespoke palladium platinum and yellow gold dress ring. 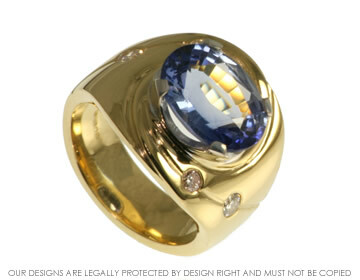 Bespoke 9ct yellow gold ring incorporating cutomers own brilliant cut sapphire and diamonds. 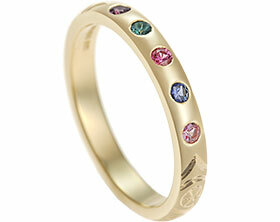 Platinum and diamond channel set ring. 18ct yellow and white gold ring with two tapered baguette cut diamond totalling 0.72ct and two sapphire totalling 1.14ctart deco inspired .